Yes, yes, I know. I haven't touched this blog in well over a year. But, that doesn't mean I haven't been looking at interesting car stuff. I realize that having been away for so long there are few, if any, people looking at this blog. Still, I felt this was worth posting. 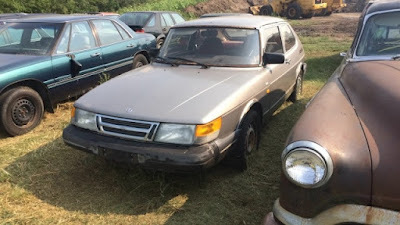 Over on Facebook, there is a very cool group called Obscure Cars For Sale. I spend way too much time perusing the cars that members of the group post. 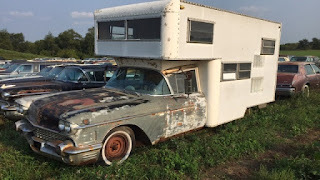 This morning, one of the members posted a few cars from the 2-Day Lazarus Museum Classic Car Auction. He mentioned that many of the cars being auctioned "are worth just above scrape now" and that the auction has not been well publicized. There are 465 cars, mostly older American cars, but a few Europeans, including a couple of Maseratis. 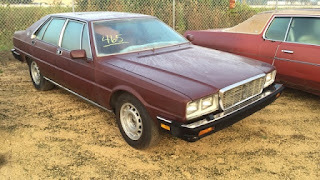 If you're looking for a new project, or a parts car for your current project, this auction may be worth checking out. It's happening October 2nd and 3rd in Roscoe, IL. You can find the website here. Good Gawd man,,, I thought something terrible had happened to you. Nice to see you back... as for the cars, those Cadillac campers are brilliant, but it seems like every one of them is in this condition. And the Saab 900 has a sweet 1990 9000 turbo (special edition with Aero/SPG wheels, maybe the Griffin?) in the background. I know full well it's a lot of work finding cars and doing a daily write-up, but bring back the car geek! Glad to see you're back, and glad I didn't change my favorites bar! Whoa! Dude, where have you been? Welcome back! We have all been wondering... how's the record shop? Thanks! The record shop was doing well, until a fire at the restaurant next door put me out of business for a month. I'm just now getting things up and running again.